– Media selection requires consideration of sample volume, the nature of the analyte, analyte concentration and the inherent properties of the sorbent itself. – Polymer loading capacities are higher than silica, however, silica sorbents exhibit greater selectivity. – Silica & bonded silica are rigid supports that do not shrink or swell with solvents. – The silica surface can be easily modified, this creates a potential for a large selectivity for purification from hydrophobic to hydrophilic interactions. – The pH stability of bonded silica is limited, typically to within the range of 2 to 7.5, this is chemistry dependant. 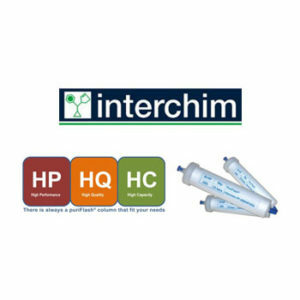 – Interchim offers more than 20 different silica based selectivities. – Interchim’s sorbents take advantage of our ultra pure spherical silica, and this achieves greater reproducibility, and establishes optimized sample recoveries. Polymer sorbents are very stable from pH 1 to 14, they exhibit high loading capacities allowing for the purification of a broad range of compounds. – Interchim’s polymers have a very high specific surface area that maximises pi-pi interactions. – The capacity of our polymers are typically 15% greater than competitive polymers and 25% higher than silicas. – These polymers are particularly suited for polar compound purification. – The polymer surface can be easily modified and facilitates a large selectivity range from hydrophobic to hydrophilic interactions.